The USA is currently looking to pass a tax bill. Actually the Republican party has decided to not seek bipartisan solutions so it is the Republicans that are looking to change the tax policy. They wish to call it tax reform but they are reforming nearly nothing. They are mainly moving around tax breaks to different people. The main aim seems to be to reduce taxes without reducing spending which given the huge annual deficit the USA government currently runs that means really this is a plan to shift taxes to the grandchildren of people living right now. And within lowering taxes for some people today while placing those payments onto their grandchildren there is a bit of shifting around who will pay what now. Mostly this amounts to lowering the taxes on the rich today – along with some lowering of many people’s taxes that are in the middle class. When you run a huge budget deficit (and have a huge amount of debt outstanding) “cutting taxes today” is just shifting taxes to the kids, grandkids and great-grandkids of those avoiding the taxes today. Truly cutting taxes (versus shifting them to a future generation) requires cutting the outstanding debt (which represents future tax increases) in addition to cutting current taxes. To find reform ideas in the proposals requires using an extremely broad definition of what reform means. There are some attempts to reduce some favors in the tax code now for special interests. But these are minor compared to the goal of shifting the tax burden to grandchildren from those alive today. One of the other goals is to reduce the corporate tax rate. This goal doesn’t look so great politically, so they are trying to minimize any focus on this. I think likely a reduction in the corporate tax rate is wise. This is mainly due, not to some principle that 25% corporate tax rate is better than a 35% rate (with all the system-wide effects that results in). Mainly a lower rate is needed when you consider the global economic system and the tax rates of other countries with an understanding of the global economy today. What must be sacrificed to reach a 20% corporate rate seems unreasonable to me, so 25% rate seems more sensible, but at this time they are trying to stretch to a 20% rate (and leave future generations to pay for the difference). I support the effort to lower the corporate tax rate. In order to pay for that reducing some deductions is sensible. The plans have some of that and while each tax break has special interests benefiting from them I would support adding to the decreases in deductions. I would go along with a 20% rate if that was necessary, but think 25% or 22% or something would be better. The most ludicrous part of the plan is the favors for trust fund babies. Eliminating the most capitalist friendly tax (the estate tax) and providing trust fund babies not only free inheritance without limit but stepping up the cost basis of investments is indefensible (economically indefensible, politically the Republicans obviously feel favors for trust fund babies are wise). See my Curious Cat Tax Proposals blog post from 2016 for more of my ideas on how tax reform should be done. The current deficit spending is made to look much less bad than it really is due to incredibly low interest rates. Given the inevitable rise in interest rates over the next 30 years the debt we pile on future generations is going to be much greater than it appears in an extremely low interest rate environment. There are essentially 4 areas of significant federal spending. There is no political will to reduce the costs of social security. I would raise the age at which you can begining taking payments and reduce payments to the rich. But this won’t pass, so that won’t change. Health Savings Accounts (HSA) allow you to save money in order to pay health expenses in a tax free account. They are similar to an IRA but are for health expenses. Eligibility is limited to those with high deductible health care plans. HSA funds can be saved over the years. Flexible spending accounts are somewhat similar but that money can not be rolled from one year to the next. The idea with HSA is you can save money in good years so you have money to pay health care expenses in years when you have them. Health Savings Accounts are meant to cover deductibles, co-pays, uncovered health needs etc. that those stuck with the current USA health care system have to deal with. HSA are best used by people who are healthy, as the idea is to save up money during healthy years so there is a cushion of funds to pay health expenses later. Health Savings Accounts are not a substitute for health care insurance. The health care system in the USA is so exorbitantly expensive only the very richest could save enough even for relatively minor health needs that are free to all citizens in most rich countries. HSA are legally available to you without health insurance but doing without health insurance in the USA is a disastrous personal financial action in the USA. And the system is even worse in having ludicrously high charges that all insurance companies get huge discounts on. But if you try to use the USA health system without insurance the unconscionable charges that no insurance company pays will be billed to you. Even if your insurance company paid nothing, the reduction in fees just due to providers not charging the massive uninsured premium charges is critical. Your HSA contribution is taken out of your paycheck on a pre-tax basis and grows tax deferred. Withdrawals from an HSA for qualified medical expenses are free from federal income tax. At age 65, you can withdraw money from the HSA to use in retirement for expenses not related to health care. You will owe taxes at this time, but no penalty. 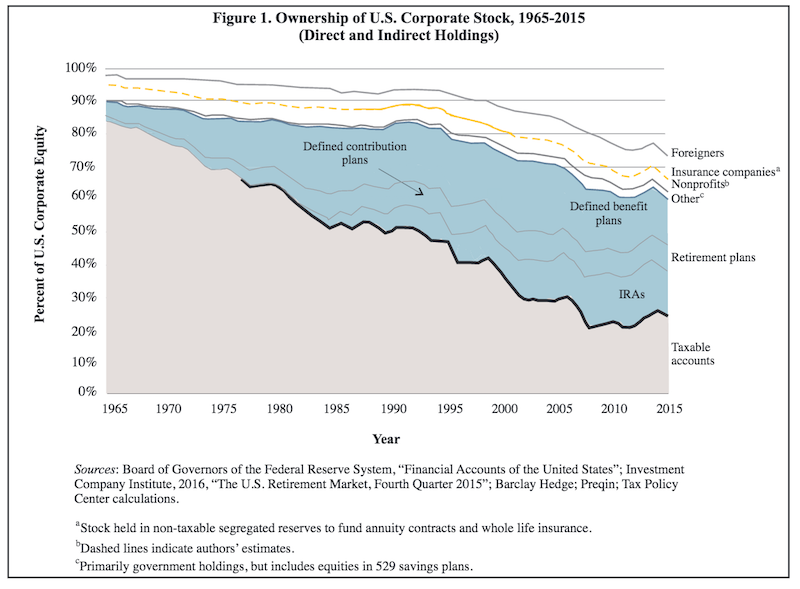 The report, The Dwindling Taxable Share Of U.S. Corporate Stock, from the Brookings Institution Tax Policy Center includes some amazing data. In 1965 foreign ownership of USA stocks totaled about 2%, in 1990 it had risen to 10% and by 2015 to 26%. That the foreign ownership is so high surprised me. Holdings in retirement accounts (defined benefit accounts, IRAs etc.) was under 10% in 1965, rose to over 30% in 1990 and to about 40% in 2015. The holdings in retirement accounts doesn’t really surprise me. As with much economic data it isn’t an easy matter to determine what values to use in order to get figures such as “foreign ownership.” Still this is very interesting data, and as the report suggests further research in this area would be useful. A business must pay several types of taxes (this posts is focused on the USA). Tax rules often change and keeping up with the rules can be a challenge. Which is why most of us, even small businesses, rely on accountants. Failure to file accurate payroll taxes or late payments can result in heavy penalties. For deposits that are made a week late, the tax penalty can go up to five percent of the past due amount. Usually the amount of penalty is measured using calendar days beginning with the due date of the tax deposit. The three penalties (failure to pay, failure to file, and failure to deposit) can add up to 33 percent penalties + interest 16 days past the due date. Payroll taxes are a huge portion of most people’s pay and those that claim some people don’t pay any tax just pretend paying this tax (which is the highest tax most workers pay) isn’t paying tax. The tax rate is 45.3% (7.65% paid by the employer and 7.65% paid by the employee. For the very wealthy this tax isn’t a huge factor as it is only applied to earned income and earnings above $118,500 (indexed to inflation, so the level increases every year) are excluded. The 7.65% figure includes 1.45% for medicare, that has no income limit (so above $118,500 the employee and employer pay 1.45% – a total of 2.9%). Options like MasterTax tax compliance software are available for businesses to help comply with all the rules. Companies can rely on automated software that houses a rules-driven database (updated with the latest rules) with thresholds and frequencies across different jurisdictions. The benefit is a month-to-month actionable calendar that enables you to make timely payments at no extra cost and without requiring third-party support. Different corporations have to pay a different percentage of corporate taxes, with penalties for late filing and errors in tax records. For example, a C corporation should file a tax return annually, and the filing deadline comes on the 15th day of the third month after the tax year ends. If the deadline is missed, the business faces a five percent penalty of the unpaid tax, and it goes up to 25 percent after the five month late. Some software provide free audit guidance from trained tax professionals to help you understand C-corporation corporate tax requirements. Businesses can also use these tools to file electronic returns and receive fast tax refunds. Some software have integrated notifications that inform you that the IRS has received your electronically filed tax return. Some states impose gross receipts taxes on businesses like transportation companies. For example, a trucking company will have to pay a tax rate of 50 mills (or 5 cents, $0.05) based on gross receipts from baggage, passengers and freight transportation. Failure to file accurately will result in a five percent penalty per month. In a tax filing software, you can create a custom workflow for gross receipts taxes and keep track of deadlines to ensure you’re filing on time and avoiding late filing penalties. You will also likely have to withhold income tax from your employees and send that to the state and federal governments. In addition, if you are a retail outlet in many states you will have to collect and forward sales tax to the state (and sometimes local) government. When you sell your primary residence in the USA you are able to exclude $250,000 in capital gains (or $500,000 if you file jointly). The primary test of whether it is your primary residence is if you lived there 2 of the last 5 years (see more details from the IRS). You can’t repeat this exemption for 2 years (I believe). It doesn’t matter if you buy another house or not, that exclusion of up to $250,000 is all that can be excluded (you must pay tax on anything above that amount – taxed at capital gains rates for long term gains). For investment property you can do 1031 exchanges which defers capital gains taxes. Otherwise capital gains will be taxed as you would expect (as capital gains). When you inherit a house the tax basis will be “stepped up” to the current market rate. So if you then sell your basis isn’t what the owner paid for it, but what it was worth when it was given to you. There have been quite a few complaints about companies hiring foreign nationals to work in the USA to save money (and costing citizens jobs or reducing their pay). The way the laws are now, companies are only suppose to hire people to work in the USA that can’t be met with USA workers. The whole process is filled with unclear borders however – it is a grey world, not black and white. I think one of the things I would do is to make it cost more to hire foreigners. Just slap on a tax of something like $10,000 per year for a visa. If what I decided was actually going to adopted I would need to do a lot more study, but I think something like that would help (maybe weight it by median pay – multiple that by 2, or something, for software developers…). It is a complex issue. In general I think reducing barriers to economic competition is good. But I do agree some make sense in the context we have. Given the way things are it may well make sense to take measures that maybe could be avoided with a completely overhauled economic and political system. I believe there are many good things to having highly skilled workers in your country. So if the problem was in recruiting them (which isn’t a problem in the USA right now) then a tax on the each visa wouldn’t be wise, but I think it might make sense now for the USA. I think overall the USA benefits tremendously from all the workers attracted from elsewhere. We are much better off leaving things as they are than overreacting the other way (and being too restrictive) – but I do believe it could be tweaked in ways that could help. 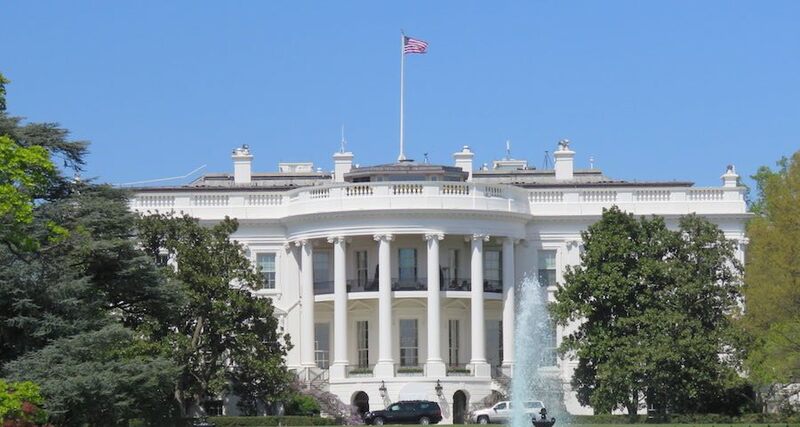 In June the U.S. Senate passed an immigration bill that allows more H-1Bs while also increasing their cost and barring some companies from placing holders of the visa with customers. Indians received more than half the 106,445 first-time H-1Bs issued in the year ending September 2011, according to a U.S. Department of Homeland Security report. The second-biggest recipient was China with 9.5 percent. While the legislation raises the annual H-1B cap to as much as 180,000 from 65,000, it increases visa costs five-fold for some companies to $10,000. It also bans larger employers with 15 percent or more of their U.S. workforce on such permits from sending H-1B staff to client’s sites. I was just taking a look at a couple of properties in Zillow and found it interesting how big the real estate tax bite can be. I have 2 rental properties and the real estate tax cost is 15% and 12% of the rental income. At least for my area Zillow underestimate rent rates (the vacancy rate is very low and properties in general rent within days or weeks – at rates 10%+ higher than Zillow estimates on average -based on my very limited sample of just what I happen to notice). I thought I would look at the real estate tax to property value estimate and rent estimate by Zillow in Various locations. 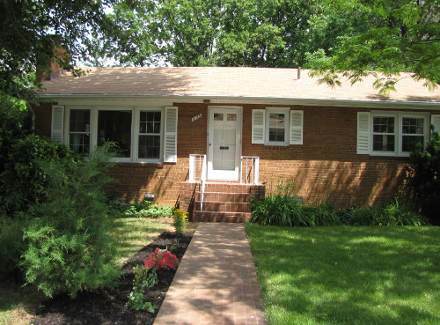 Arlington, Virginia – real estate taxes were 1% of estimated property value and 17.5% of rental estimate. Chapel Hill, North Carolina – 1.5% of value and 41% of rental estimate. Madison, Wisconsin – 2.4% of value and 39% of rental estimate. Flagstaff, Arizona – .7% of value and 9.5% of rental estimate. Grand Junction, Colorado – .4% of value and 6% of rental estimate. This is just an anecdotal look, I didn’t try to get a basket of homes in each market I just looked at about 1-5 homes so there is plenty of room for misleading information. But this is just a quick look and was interesting to me so I thought I would share it. While the taxes are deductible (from the profit of the rental property) they are a fixed expense, whether the house is rented or not that expense must be paid. A high tax rate to rental rate is a cash flow risk – you have to make that payment no matter what. In my opinion one of the most important aspects of rental property is keeping the units rented. The vacancy rate for similar properties is an extremely important piece of data. Arlington, Virginia has an extremely low vacancy rate. I am not sure about the other locations. I wanted to use Park Slope, Brooklyn, NYC but the data was confusing/limited… so I skipped it; the taxes seemed super low. I am glad we have a “fiscal cliff” to finally get some reduction in the future taxes both parties have been piling on with abandon the last few decades. When you have enormous spending beyond your income, as the USA has had the last few decades, cutting current taxes is just raising taxes on your grandchildren to pay for your spending. Shifting taxes to your grand children is not cutting taxes it is shifting them to future generations. If you want to really cut taxes you must cut taxes and not pass on paying for your cuts to your kids. It seems pretty obvious those that advocating cutting current taxes the last few decades were only interested in living beyond their means today and foisting the responsibility to pay to their grandchildren. That is despicable behavior. The fiscal cliff is an opportunity to return to a budget that has the generation doing the spending paying the taxes (last seen in the Clinton administration). The fiscal cliff outcome is going to be far from perfect. But the result will be a much more honorable outcome than foisting ever increasing taxes on future generations to pay for our current spending. Obviously, if you reducing how much you are adding to your credit card balance each month and start paying your bills that means you don’t get to live off your future earnings today. So you will suffer today compared to continuing to tax the future to pay for your spending. I hope the compromise results in spending cuts and an elimination of the Bush generation shifting taxes (cutting taxes on the the current wealthy without spending cuts – so just taxing the future to pay for tax cuts today). It is unlikely the fiscal cliff results in us actually paying for our spending (the best possible result is not an elimination of adding to the taxes future generations must pay but just a reduction in the level of tax increases we are imposing on the future every year). Lots of little things should be done to save a few billion (maybe it could add up to $50 billion a year if we are very lucky). But the serious spending cuts have to come from reductions in military spending, reducing waste in the health care system and making social security more actuarially sensible (social security is not part of the fiscal cliff discussions though). Reducing tax breaks also has to happen, unless absolutely huge spending cuts can be found which is not at all likely. Very interesting USA federal tax data via the tax foundation. Top 1% has adjusted gross income of $343,000; over $154,000 puts you in the top 5%; $112,000 puts you in the top 10% and $66,000 puts you in the top 25%. The chart only shows federal income tax data. So the costly social security tax (which is directly based on earned income* so in reality is federal income tax but is handled in a separate account so is consistently not classified as income tax data) for outside the top 5% (income above $106,800 [for 2011] does not have to pay the social security tax) is not reflected in the rates paid here. Looking at the data excluding social security is fine, but it is very important to remember the social security (plus medicare) tax is the largest tax for, I would guess, most people in the USA. Social security tax is 6.2% paid by the employee plus 6.2% paid by the company – a total of 12.4%. That part of the tax was capped at $106,800 in income for 2011. The medicare tax is 1.45% of income paid by the employee and 1.45% paid by the employer (and it has no cap). So that totals 2.9% (for the employee and employer tax) and brings the total to 15.3%** for most earned income. Source: Internal Revenue Service. Table via the tax foundation. Other interesting data shows that the top 1% earn 16.9% of the total income and pay 36.7% of the total federal income taxes. Those in the top 1-5% earn 14.8% of the total income and pay 22% of the income taxes. Those in the top 5-10% earn of the income 11.5% of the income and pay 11.8% of the federal income taxes. So once you exclude the main tax on income (social security) and use adjusted gross income the tax rates are slightly progressive (higher rates for those that are making the most – and presumably have benefited economically the most from the economic system we have). Given that this is skewed by excluding the regressive (higher taxes paid by those earning less – social security is the same rate for everyone except those earning the very most who don’t have to pay it on their income above $106,800 [in 2011]) social security tax I believe we should have a more progressive tax system. But that is mainly a political debate. There are good economic arguments for the bad consequences of too unequal a distribution of wealth (which the USA has been moving toward the last few decades – unfortunately). In addition to the other things I mention there are all sorts of games played by those that desire a royalty type system (where wealth is just passed down to the children of those who are rich, instead of believing in a capitalist system where rewards are given not to the children of royalty but to those that are successful in the markets). A good example of the royalty model is Mitch Romney giving his trust fund children over $100 million each. These schemes use strategies to avoid paying taxes at all. Obviously these schemes also make the system less progressive (based on my understanding of the tax avoidance practiced by these trust fund babies and those that believe it is ethical to give such royalty sized gifts to their royal heirs). I don’t like the royalty based model of behavior. I much prefer the actions of honorable capitalist such as Warren Buffett and Bill Gates that give their children huge benefits that any of us would be thrilled with, but do not treat them as princes and princesses who should live in a style of luxury that few kings have every enjoyed based solely off their birthright. Both Bill Gates and Warren Buffett have honorably refused to engage in royal seeking behavior that many of their less successful business peers have chosen to engage in. Those that favor trust fund babies are welcome to their opinion and have managed to get most of congress to support their beliefs instead of a capitalist model that I would prefer so they are free to engage in their desire to parrot royalty and honor the royalty model of behavior. * earned income – you also don’t have to pay social security or medical tax on unearned income (dividends, capital gains, rental income…). Again this by and large favors wealthy taxpayers. Everyone is eligible for the same favorable tax treatment but only those that have the wealth to make significant amounts of unearned income get this advantage. ** the social security tax has been reduced by 200 basis points (this relief was recently extended) as part of dealing with the results of the too big to fail banking caused credit crisis. So under the temporary reduction the personal tax rate is 4.2% and the total cost is 13.2%.